The Project covers most of the Gum Creek Greenstone Belt, situated within the Southern Cross Province of the Youanmi Terrane, a part of the Archaean Yilgarn craton in Western Australia. The Gum Creek Greenstone Belt forms a lensoid, broadly sinusoidal structure about 110km long and 24km wide, dominated by volcanic and sedimentary sequences and surrounded by intrusive granitoids which contain rafts of greenstones. The margins of the belt are typically dominated by contact-metamorphosed basalts and banded iron formations. The greenstone sequence is relatively simple, with three broadly continuous major geological units occupying a large north-south synclinorium. The lowest unit consists of a sequence of interbedded banded iron formation and mafic and ultramafic volcanics overlain by ferruginous shales, shales and thin cherts. The central unit consists of a sequence of basalts and felsic volcanics, contemporaneous dolerites, and lesser ultramafic volcanics and interflow sediments. The central unit has been intruded by differentiated gabbroic sills which range in composition from ultrabasic through to pyroxenite to gabbro. The uppermost unit consists of shales, black shales, siltstones and minor cherts, with rare conglomerates and dolostones. Late stage, generally massive granitoids intrude along the length of the belt. Several early phases of tight to isoclinal folding have affected rocks of the lower domain. Most fold axes now exhibit a general north-south trend. The whole belt has been folded about tight north-north-west axes, producing two synclines separated by a narrow anticline in the central domain. The western syncline appears to be doubly plunging suggesting late open folding under an east-west stress regime. Complex faulting is present throughout the Gum Creek Greenstone Belt, with many lithological units being fault bounded. Prominent deformation also occurs as regional-scale north-northwest trending ductile shear zones. These zones occur in close proximity to gold occurrences at Bolger Well, Gidgee, Victory Well, Tokay and Wilsons. Quartz-carbonate (±pyrite, arsenopyrite, galena & sphalerite) veins. Typically free milling and locally high grade (>20g/t Au). Form complex conjugate vein arrays associated with brittle dilational openings developed along major shears within competent mafic host rocks. Carbonate-sulphide wall-rock alteration is common about mineralised zones and extensive supergene enrichment often overlies the primary mineralisation zones. Deposits of this type represent the dominant mineralisation type at Gum Creek and include Swan Bitter, Swift, Kingfisher and Wyooda/Thangoo. Ductile shear hosted mineralisation – arsenopyrite dominant. Fine grained gold associated with sulphide rich, intense biotite-sericite altered narrow ductile shear zones. Gold grades are typically in the range 5-10g/t Au. Arsenopyrite and pyrrhotite are the dominant sulphides with most gold locked within the arsenopyrite. 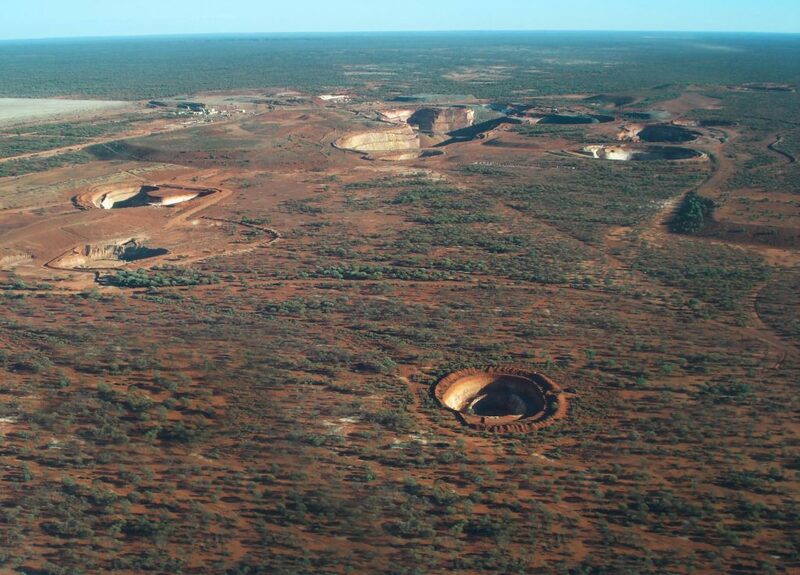 Examples of this style of mineralisation are the refractory deposits of Wilsons, Heron South, Snook and Camel Bore. Ductile shear hosted mineralisation – pyrite dominant. Fine grained gold associated with sulphide poor, broad ductile shear zones developed within mafic host rocks. Shearing typically defined by weak biotite alteration, up to 1% fine pyrite and a sparse network of thin (1-3mm thick) quartz veins. 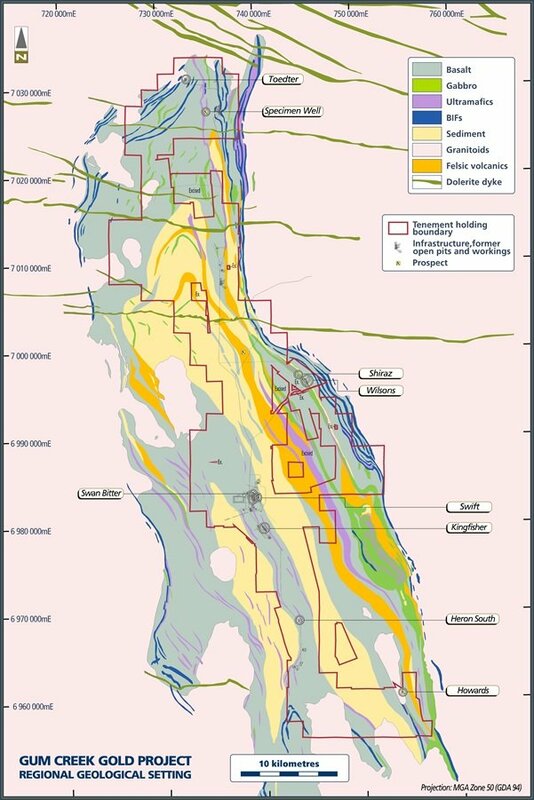 Gold grades are typically in the range 0.5–1.5g/t Au and the mineralisation is free milling. The Howards deposit is representative of this mineralisation style. BIF hosted mineralisation. Quartz-pyrrhotite veining and pyrrhotite replacement of magnetite meso-bands form narrow steep-plunging shoots of limited length and width, but extending to depth. This mineralisation style occurs in fold hinges within banded iron formation marginal to major north-south shear zones, and is similar to the Hill 50 mineralisation at Mt Magnet. Grades are typically 1-10g/t Au and the mineralisation is free milling. The Omega deposit is of this style. Quartz veins. Sulphide poor, sheeted and anastomosing quartz veins and lenses developed in shears straddling granodiorite contacts within the Gum Creek Greenstone Belt. Grades are typically 1-5g/t Au. The Montague deposits, which are free milling, represent this style of mineralisation.